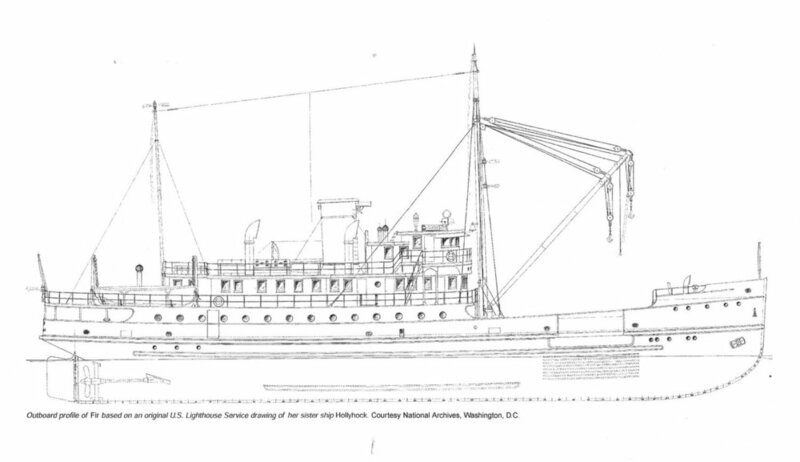 The Fir (USCGC 212) was commissioned as a lighthouse tender in 1940 serving the United States Coast Guard for 51 years -- a remarkable accomplishment. She earned the title "Queen of the Fleet" in 1988 as the Coast Guard's longest serving vessel, Upon her retirement in 1992 the United States Secretary of Interior declared Fir a National Historic Landmark. She spent a number of years in maritime museums before being sold to a private individual. The Lighthouse Project LLC bought her in the Spring of 2017 with the intention of restoring and repurposing her for continued service and circumnavigation of the world. This site provides a detailed account of the restoration plans, our actual experiences and eventually taking her to sea. The Restoration tab opens a drop down menu of links under reconstruction. Follow or Progress as we blog about multiple projects being juggled at one time. Documentary videos will provide chronological insight into our ongoing efforts and adventures. The success of this project is largely due to contributions from great companies and support from the maritime community. See our "Partners" pages for a list of contributors and a complete review of products used on the Fir. Looking for more information about the restoration or want to join the conversation? Click on the image below to join the Fir 212 Restoration Facebook group!